Your wedding ceremony is a sign of your love and lifelong commitment to each other. It is an expression of your faith in God and your faith in each other and is, therefore, one of the most significant events of your lives. The Chaplain's Office is happy to assist you with your marriage preparations. To assure that these preparations progress smoothly, please read the following information. Only Roman Catholic religious ceremonies are permitted. The St. Mary of the Angels Chapel seats approximately 225 people. Friday at or after 5 p.m.. with a Thursday Rehearsal after 6 p.m.
Saturday at or after 11 a.m. until 6:00 P.M. with a Friday Rehearsal after 5 p.m. The officiating priest or deacon conducts the rehearsal usually the evening before the wedding. The Chapel must be reserved for your wedding a minimum of 6 months before your wedding date. You are responsible to provide the Roman Catholic clergy to officiate at your wedding. You are welcome to ask a friar-priest from Siena College or another Roman Catholic priest or deacon to officiate at the ceremony. In the early stages of your wedding planning, please contact The Office of the College Chaplain to assist you in the planning of your ceremony. An organ and a piano are available in the Chapel. We understand the importance of preserving your wedding ceremony on film or video. You should inform your photographer(s) of the Sacramental nature of the ceremony. Photographers and video personnel must be discreet and respectful during the ceremony so a prayerful spirit prevails throughout the entire ceremony. Photographs may be taken inside the Chapel immediately after the ceremony, unless there are other services scheduled to take place in the Chapel after the ceremony. Photographs are permitted in the front area outside the Chapel after the ceremony and the Grotto area, provided the area is cleared within the designated completion time of the reservation. Photographs are not permitted in any other areas of the college. 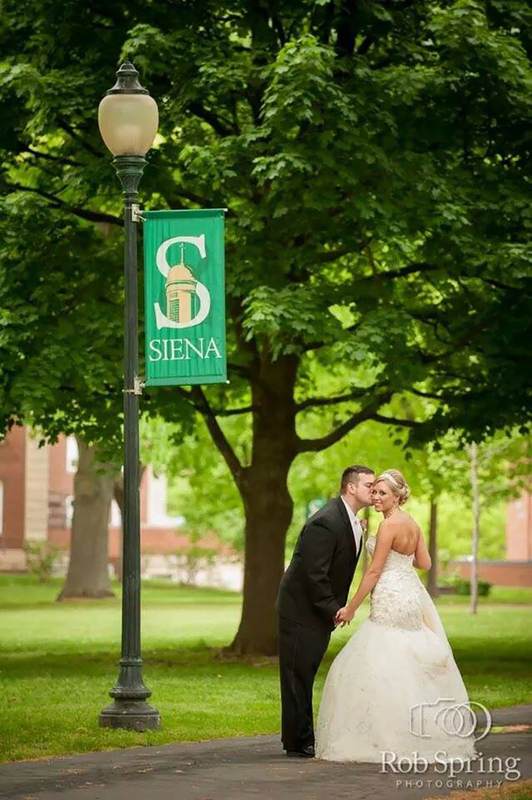 There is a $500.00 fee for the use of Siena College’s St. Mary of the Angels Chapel. Two-hour block on day of ceremony. One-hour block on preceding day for rehearsal. Assistance of a student worker or staff person at the Chapel during rehearsal and ceremony. Upon securing your reservation for your Marriage Ceremony at St. Mary of the Angels Chapel, a packet containing additional information as well as our complete Wedding Policy Agreement will be sent to you. If you have any questions please contact Colleen Sheedy, at chaplainsoffice@siena.edu or at 518-783-2332.